Staying in the best accommodation on each leg of the trek, you can experience the iconic W-trek at the highest level of comfort, giving you the opportunity to really relax your legs after each trek. Guiding yourself you can enjoy everyday at your own pace, seeing all the park's main sights. 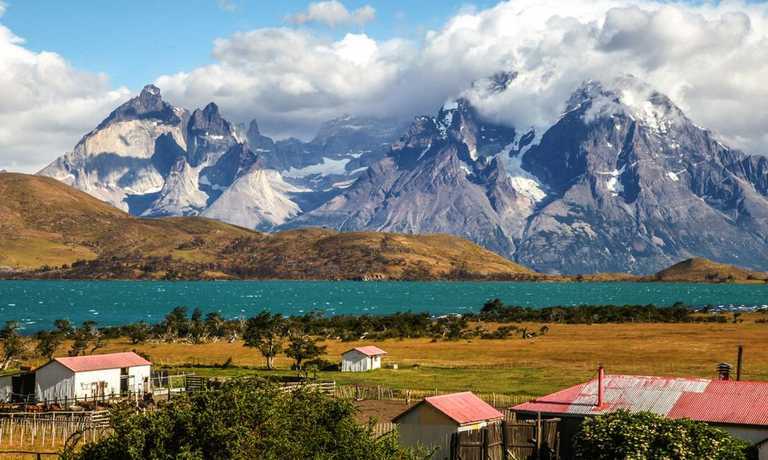 Starting from Puerto Natales at 7:00 AM you will take a public bus all the way to Torres del Paine National Park. You will drive through open pampas and huge ranches (estancias), and chances are we you be able to observe one of the most typical animals in this area, the nandu, (rare South American ostrich). The bus arrives to Laguna Amarga the main entrance to the park where you connect with a shuttle to the Hotel Las Torres. 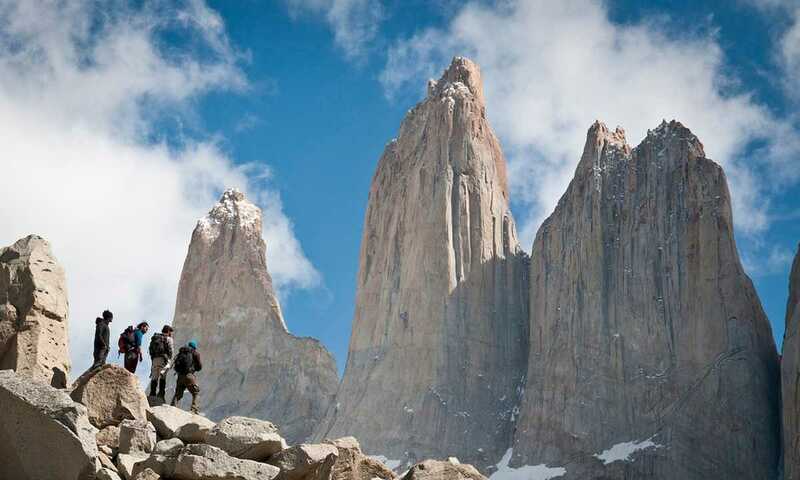 After leaving your backpack at Hotel, you start the trek with your lunch box to the base of the Towers, following the Ascencio River to enter the Ascencio Valley. The walk will be uphill for one hour before stopping to observe the first glimpses of the valley surrounded by unbelievable beech forests, glaciers and waterfalls. You'll continue through the valley for another hour and a half before ascending a huge terminal moraine to a lookout (900 M), excellent for picture taking. This amazing view will be accompanied by lunch to add to the enjoyment. After being awed by the towers you'll start the descent, following the same path back to the hotel. Dinner will be served in the hotel. After breakfast at the Refugio you request your pack lunch and start the hike to Refugio Los Cuernos. As you leave the hut you will arrive at Inge lagoon. Chances are, on this path, you may see the flight of an Andean condor or eagles hunting hares or small rodents. You follow a well mark trail ascending around (200 mts.) from the base of Almirante Nieto Mountain (2750 mts. ), crossing the Bader River to arrive at Refugio Los Cuernos where you will stay overnight, after enjoying a good meal. After a breakfast in the Refugio, and once you request your pack lunch from them; you will start the day with a 2-hour walk going to an undulating path until reaching the French River for your first glimpses of the hanging glacier. Then you will ascend (300 M) for one hour through a surreal Japanese garden landscape, crossing beech forests, to reach the French valley viewpoint gifting you with a magnificent view of both mountains and lakes. Your way back will be the same until you reach the entrance of the valley where you will continue on a different path around the South- West side of Paine Grande, the highest peak in the Park, through native forests of Chilean fire bush and evergreen beech (Nothofagus Bethuloides), up to the shore of the Pehoe Lake. Dinner will be served in the Refugio. You will begin early morning with the hike to the Grey Glacier. 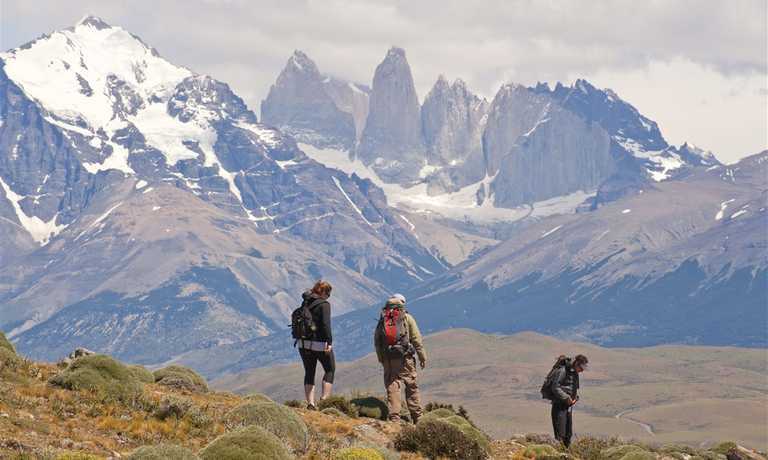 Initially ascending 200mts up a winding narrow path leading us to Laguna Negra, a place where you will observe the first glimpses of the South Patagonia Ice Field with its many unclimbed mountains. You will advance through forests and rivers, with possible sightings of spectacle and flying steamer ducks, up to the glacier viewpoint. You will have lunch at this place to see, if we are lucky enough, ice calving from the huge glacier wall. Optional Ice hike or Kayak (book in advance, please contact our Travel Specialists). At 1 PM you will take a boat to navigate for a while in front of the glacier in the hope of seeing icebergs calve. The return journey offers views of Paine Grande with its impressive ice mushrooms and we sail through icebergs of different tones of blue. 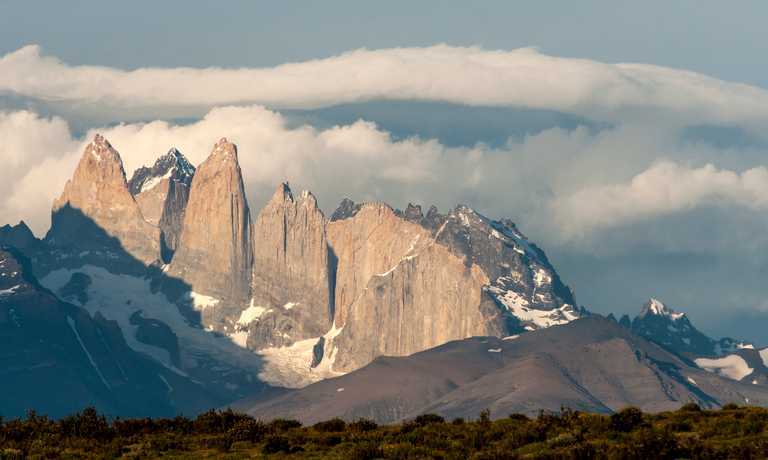 A private transfer will be waiting for you to drive back to Puerto Natales on a different road with great views of the Paine Mountain from a different perspective. This trip can run as a group trip, with prices starting from $1,495 per person for a complete group. If you are looking to join a group or you are a solo traveller we will help to form likeminded groups of travellers. Please let us know your travel plans. We include a bed with sheets, blankets and a pillow for the three refugio nights.